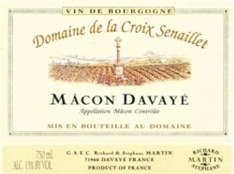 Croix Senaillet Macon-Davaye 2014 is 100 percent Chardonnay. Pale brilliant yellow color. Fresh nose of citrus fruits (lemon, grapefruit). Mineral and salty notes on the palate. Fresh, supple and harmonious in the mouth. Produced from 7 different parcels of vines spread over 3.77 hectares, planted on clay and limestone based soils. Average age of the vine is 28 years. Careful vinification. Minimal intervention in the vinification process. Modern equipment (pneumatic press, thermo-regulated tanks). Each parcel is harvested at full maturity. Destemming, slow press, slow fermentation, malolactic fermentation, aging on the lees. Excellent as an aperitif and pairs well with grilled fish and Asian food.